insight they need, when and where they need it. Clinicians are also increasingly reliant on IT and biomedical technicians to keep everything up and running. And as technology is becoming more central to a hospital-wide clinical collaboration system, technicians need solutions that expand clinical capabilities and do not strain the limited resources of time, money and expertise. Olympus Systems Integration understands the challenges healthcare professionals face every day. And we have procedure space integration solutions that deliver significant advantages for everyone. Provides exceptional image and video quality to allow precise and confident procedures. 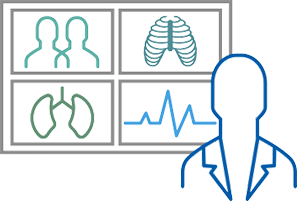 Integrates images and information with the HIS, PACS and VNA systems for rapid. Simplifies collaboration with colleagues and patients. Eliminates distractions and reduces stress with easy to use technology, enabling you to focus. Enables easy capturing, editing and sharing of all media files and presentations across. Improves efficiency and reduces the learning curve with a single, intuitive interface. Supports patient safety and reduce potential for errors by automating tasks. 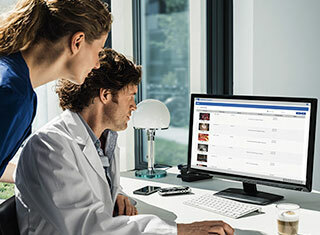 Connects clinical teams with relevant images, videos and information. Optimizes efficiency and revenues by improving procedure room turnover time and increasing. 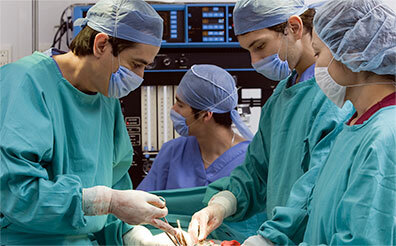 Improves patient satisfaction by providing a smooth transition into the procedure room. Increases staff retention by making the clinical experience more pleasant. Integrates without straining storage, server and network infrastructure. Requires minimal effort for implementation, training, management and maintenance for all. 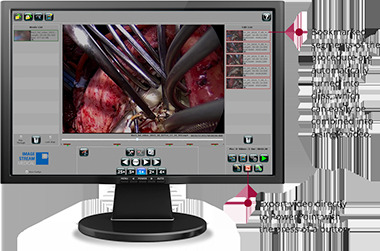 Easily integrates any procedure room image or video source and hospital-wide information. Provides hospital-grade IT security with automated security patches, virus updates and daily. Supports GDPR conformance by meeting the highest standards for information security. Olympus Systems Integration connects care teams with clear visual information and collaborative insight across the healthcare enterprise. Our vendor-neutral solutions combine cutting-edge technologies to give clinicians the power to control their procedure rooms, easily sharing visual information with colleagues inside the room and out. Our technology integrates seamlessly with existing workflows, freeing clinicians to focus on delivering high-quality patient care. Experience ultra-high definition (UHD) video in its purest form. EasySuite 4K is our next-generation procedure room integration solution featuring full-room routing of native, uncompressed 4K video via a 10G Ethernet-based switching architecture, providing unparalleled clinical precision and future-proof flexibility. Transform the efficiency of any procedure environment with a comprehensive solution that supports clinical workflows at every step of the procedure. Control any procedure room with ease—operating rooms, interventional X-ray, catheterization labs, electrophysiology labs,trauma bays, and more. Deliver crystal-clear 4K video and images—plus clinically relevant patient information—to each care team member, when and where they need it. Collaborate with colleagues during procedures, without missing a beat. Manage it all with a powerful procedure space integration solution that lets you focus on the patient, instead of the technology that makes it possible. EasySuite 4K brings together the capabilities care teams need to perform more effectively and efficiently—in a single, easy-to-use, vendor-neutral solution. Designed around your team, EasySuite 4K creates an environment that understands and adapts to your clinical workflows right from the start. Record procedures quickly and easily to facilitate training, documentation, and knowledge sharing. Using video to document procedures or techniques is essential for consulting with peers and families, as well as for knowledge sharing, training, and continuous improvement. Whether you need a stand-alone recording solution or video recording as part of comprehensive OR integration solution, Systems Integration Medical makes it simple. Our family of recording solutions includes our cart-based nCare® MX and our fully integrated nCare® RX, both built on our powerful, reliable, easy-to-use platform. Capturing high-resolution video or images from virtually any surgical device is simple with nCare MX. Easily capture, view, print, and export video using the nCare touch panel or a remote computer or mobile device like an iPad®. Store data locally, export for presentations, or submit to PACS or a centralized VaultStream® server. The same advanced solution offered by our partners as the nStream® GX. With nCare RX, part of our EasySuite® OR Integration solution, you can easily capture, store, recall, and export high-definition video and images via the intuitive EasySuite interface. It connects seamlessly to our VaultStream server, PACS, or the patient’s electronic health record (EHR) for rapid video or image retrieval and review. Smart technology guarantees data integrity during transfer to the VaultStream so valuable procedure information is never lost. Videos and images are all captured and stored securely. User authentication helps prevent unauthorized access, protecting patient privacy and supporting regulatory compliance. Enable remote participants to be virtually present in the procedure space through a rich, interactive experience. Bring the right expertise to the procedure space or training room from across the enterprise or around the world, anytime—virtually. MedPresence extends the capabilities of our EasySuite® 4K Procedure Room Integration solution, enabling new collaboration models that empower clinical teams to work in ways never before possible. With MedPresence, participants interact just as if they were in the room together. Remote colleagues, students, and vendors can fully participate in the procedure space through a rich, interactive experience combining video, audio, and relevant contextual imagery and information, with shared control and real-time telestration. Improve clinical workflows and empower clinicians to be productive, no matter where they are. 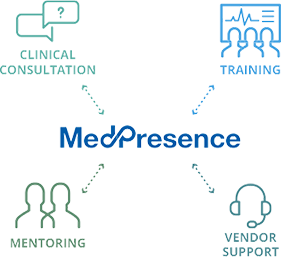 MedPresence goes beyond traditional video or web conferencing or telemedicine apps, creating new, interactive collaboration models for clinical consultation, training, mentoring, and vendor support—all at a moment’s notice. And MedPresence is designed specifically for high-acuity, visually-intensive clinical environments, seamlessly integrating with your workflow. 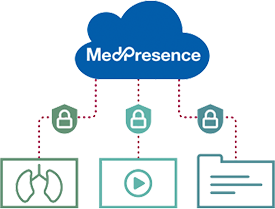 Built from the ground up as an enterprise solution, MedPresence features encrypted, end-to-end security to protect the integrity of sensitive information. Innovative features like automated masking of PHI enable real-time collaboration, while protecting patient and clinician privacy, and HIPAA compliance. With MedPresence, clinicians are always in control, fully aware of when the room is “on air” and when remote participants “enter the room.” Participants can be excluded at any time and the room can be placed in privacy mode with the touch of a button. Minimizing the number of people in the OR is important for maintaining care team focus and reducing the risk of infection. Systems Integration Medical makes it easy to bring the procedure to colleagues and visitors across the enterprise with secure live video streaming. Our LiveStream® Network securely streams video throughout the hospital network. Using our browser-based LiveStream Portal, clinicians can view live video from any PC connected to the hospital network. Privileged users also have the ability to remotely select video sources within a room. Our streaming solutions support a range of activities that promote learning and efficiency. Clinicians can remotely monitor the progress of residents or learn from a colleague’s procedure via LiveStream Portal. Using our Real-time Room Status solution, they can check to see if a room is ready for use, saving time. User authentication ensures appropriate access to in-room video feeds. And in-room personnel can control remote access, ensuring patient privacy is always maintained. Facilitate collaboration with conferencing and video streaming accessible anytime, anywhere in the enterprise. Need connectivity to legacy video conferencing rooms or codecs? EasySuite® Video Conferencing makes it easy for clinicians to participate in video conferences with colleagues outside the procedure space. Clinicians can initiate and participate in video conferences on demand, using the same simple EasySuite interface they use every day. Based on industry standards, EasySuite Video Conferencing connects users with colleagues on the local area network using legacy video conferencing systems in procedure spaces, offices, and dedicated video conference rooms. So clinicians can easily conference with colleagues across the health system. Maximize the value of procedure videos and images by making them readily accessible for reviews and consultations. For clinical video and images to be of value, clinicians must be able to quickly and easily access them for future reference, review, and consultations. Systems Integration Medical makes sophisticated content management simple, giving clinicians the ability to locate and view procedure video easily and securely, from virtually anywhere on the hospital network. 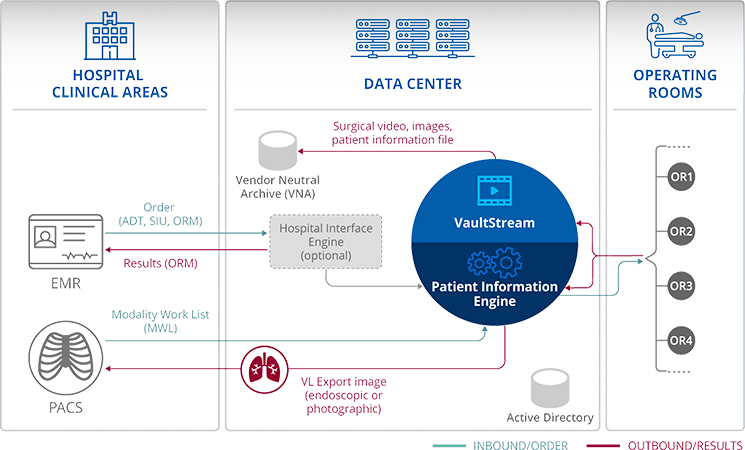 Our VaultStream® solution provides secure, anytime, anywhere access to a clinical library of digital video, images, and procedural data. Multiple users can simultaneously search, access, edit, and review data remotely. Compare-mode allows clinicians to view procedures side by side for closer analysis. Configurable data retention policies allow content managers to control storage utilization. VaultStream also provides the ability to create multiple libraries for managing non-clinical and teaching content for learning and presentations. With our EasyView® web-based and EasyView® Mobile solutions, users can access clinical video and images wherever they are, including via their Apple iPad®. Simply select a procedure to view, then select the thumbnail you want to view. This intuitive app allows full-screen viewing, with the ability to quickly swipe through thumbnails to find an image or video. Give physicians the ability to create presentation-ready procedure videos in minutes, on their own. Video recordings of procedures are powerful tools for teaching and knowledge sharing. 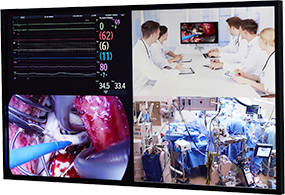 With our VaultStream® EasyCut® solution, physicians can easily create presentation-ready videos on their own in just minutes—with no special skills required. Clinicians can actually edit videos during procedures. Simply push a button or footswitch to bookmark key video segments. EasyCut automatically turns bookmarked sections into clips for fast, easy editing. Create your PowerPoint presentations right from EasyCut by inserting your edited videos and images quickly and easily. After the procedure, there’s no need to wait for videos to be copied to local drives. In collaboration with VaultStream, EasyCut copies only the clips users need, safely maintaining the original video on the VaultStream server. That means faster editing. And avoiding use of unsecured media, like USB drives, enhances data security. Give clinicians the clinical context they need by combining procedure video and images with information from EHR, PACs, and VNA systems. Integrating procedure video and images with relevant patient information can add vital context for clinical decision-making. Olympus Systems Integration connects physicians with clinically relevant information from across the enterprise. Our solutions integrate seamlessly with electronic health record (EHR) systems, picture archiving and communication systems (PACS), and vendor-neutral archives (VNA). Our solutions support a unified patient record through full support for both inbound orders and outbound results exchange. Inbound orders and modality work lists (MWL) support automatic patient registration. Following the procedure, outbound video and image results are automatically integrated with the patient’s EHR, PACS, VNA, or other repositories, creating a unified patient record. Automated discharge further streamlines clinical workflows. Our Patient Integration Engine provides a single point of communication to hospital systems, brokering all inbound and outbound communication. This means you don’t need a separate connection to each hospital system from every procedure room. Just as every hospital is unique, so is every integration. Our experienced services team has the expertise and know-how to integrate Olympus Systems Integration solutions with systems of virtually any commercial vendor, whatever your configuration. Helpful resource to prepare and plan for your room integration project, while avoiding common pitfalls. Registration required. 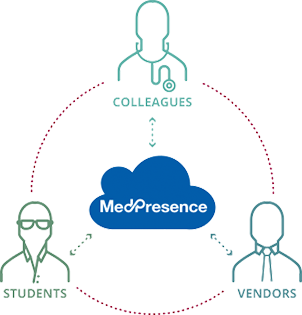 Overview of the first medical virtual presence solution for the hospital enterprise Est. read time 2 min. 48 sec. In this 25-minute recorded video presentation, Dr. Raley explores the relationship between effective team communication and medical performance in emergency and critical healthcare settings. Gain insights from Dr. Jessica Raley on how to assess your team’s communication to improve patient care in the procedure suite Est. read time 3 min. 42 sec. Overview of our centralized content management system that provides secure, HIPAA compliant storage and access for medical case video and images. 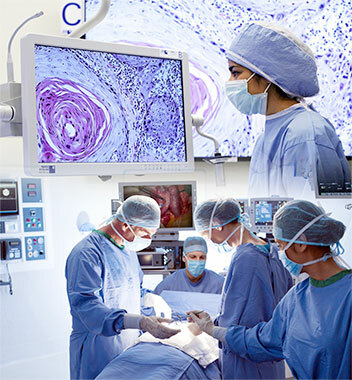 Whether you are designing a new, state-of-the-art hybrid suite or looking to optimize your existing operating rooms, Olympus Systems Integration brings a wealth of expertise to the challenge. Our service and implementation teams—system designers, OR planners, project managers, and service engineers—have experience and knowledge gained through hundreds of successful procedure space integration projects. They focus on delivering solutions tailored to your needs, while making the process easy and stress-free for you. Our experienced integration engineering and design team works with your architect, contractor, and room planner to develop plans that ensure seamless integration of Olympus Systems Integration technology with your procedure space or conference room. Whether building new or upgrading an existing space, we can help you realize your vision with ease. Room integration is all we do, so we know how to avoid common pitfalls and design rooms with the future in mind. Our ability to anticipate potential issues and provide creative solutions can save you significant time and money, and avoid headaches. Our design team coordinates the thousands of technical details involved with making sophisticated integrated rooms work seamlessly. Getting us involved at the earliest stages helps streamline the design process—and avoid change orders down the road. We can create a custom, integrated conference space that takes collaboration and education to the next level. Seamless integration with our EasySuite® Procedure Room Integration solution brings the OR into your conference room. Our seasoned implementation team ensures your procedure room vision is fully realized. Led by a dedicated Project Manager, our multidisciplinary team of engineers and installers attend to every detail to ensure your Olympus Systems Integration technology is integrated seamlessly. Our Project Managers and Field Service Engineers have extensive experience installing and integrating our technologies. Throughout the process, they work closely with contractors and others on-site to make sure everything comes together smoothly and on schedule. We have a solid understanding of local code requirements in markets nationwide, helping avoid costly surprises and delays. Our implementation team doesn’t disappear when installation ends. We provide multiple days of on-site support at go-live to ensure everything works perfectly. Olympus Systems Integration solutions are designed from the ground up for simple, intuitive operation by your clinicians. We complement this advantage with customized training services to ensure your institution achieves the full benefit of our technology right from the start. We can provide training and education to meet the needs of specific groups—from user training for physicians and nurses to technical training for biomed engineers and IT. We can also provide executive education for administrators, ensuring they understand their facility’s new capabilities and how they support business objectives. We conform to your education needs and schedule. 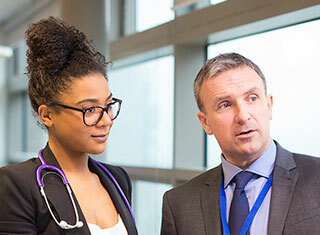 Our Education & Training team can deliver training on-site or via remote access, with curricula tailored to specific staff needs or clinical specialties. Olympus Systems Integration’s unique combination of technology expertise and clinical workflow knowledge can be a tremendous advantage when tackling tough technical challenges. We can assist your in-house technologists and clinical teams with expert professional services to help you achieve your goals faster and more efficiently. Tapping our years of healthcare system integration experience can help accelerate procedure space integration projects. Our engineers know what works—and what doesn’t. They can provide custom integration solutions to achieve seamless interoperability of disparate systems, including EHR systems and other data repositories, to complement our unique clinical workflows. Our experience working with hundreds of healthcare organizations has given us in-depth understanding of best practices for leveraging our technology. We can consult on a range of technology best practices—from optimal use of Active Directory to placement of video source wall plates. And we can consult on procedure room workflows, helping clinical teams streamline and optimize their processes. We understand the critical role our technology plays in healthcare. Our experienced Support team is committed to keeping Olympus Systems Integration solutions up and running perfectly—day in and day out. For Technical Support, please call (866) 376-6800. Our factory-trained Tech Support specialists are available 24 x 7 to address issues and questions. In as much as 80% of the cases, they can resolve issues right over the phone or via remote access. If new parts are required, our parts depots across the country ensure immediate replacement availability. Issues that cannot be resolved remotely are escalated to our Field Service engineers for rapid, on-site response. If needed, they can engage the very same Olympus Systems Integration engineers who designed our systems, to ensure resolution. To access updates for Olympus Systems Integration solutions, visit our support download page. To view recommended updates for our solutions, visit our Microsoft update page. To put our system support expertise to work for you, contact us today.